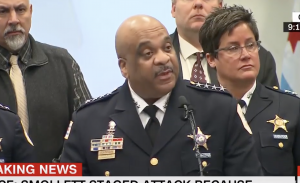 Chicago Police Superintendent Eddie Johnson painted a stark picture of the harm caused by "Empire" actor Jussie Smollet's alleged hate crime hoax on Thursday, blasting the performer for hurting real victims and manipulating the issue of race to further his own career. Smollett surrendered to police on Thursday after being charged with disorderly conduct by filing a false police report, after claiming for weeks he was the victim of a hate crime perpetrated by Donald Trump supporters. At a news conference airing on every cable news channel, Johnson first admonished the gathered media for not giving this kind of attention to the city's gun violence victims. Johnson said Smollett had taken advantage of the "pain and anger of racism to promote his career." He said, due to dissatisfaction with his salary on the Fox TV show, Smollett sent a fake, threatening letter to himself with "MAGA" written on it, to suggest he was being targeted by a Trump supporter. When that didn't work, he paid two brothers, one an extra on "Empire" and the other his personal trainer, $3,500 to attack him. Smollett, who is gay and African-American, claimed his assailants yelled racist and homophobic slurs at him in the early morning of Jan. 29, poured bleach on him, tied a rope around his neck, and yelled "This is MAGA country," to suggest they were Trump supporters. A hate crime investigation was launched, but as his story drew more skepticism, he went on ABC News and cried that he wasn't being believed and said he would never make such a thing up. "I'm left hanging my head and asking why," Johnson said. "Why would anyone, especially an African-American man, use the symbolism of a noose to make false accusations? How could someone look at the hatred and suffering associated with that symbol and see an opportunity to manipulate that symbol to further his own public profile?" Bogus police reports cause "real harm," Johnson said, calling Smollett's actions "shameful." "They do harm to every legitimate victim who is in need of support by police and investigators, as well as the citizens of this city,"" he said. "Chicago hosts one of the largest pride parades in the world, and we're proud of that as a police department and also as a city. We do not nor do we ever tolerate hate in our city, whether that hate is based on an individual's sexual orientation, race or anything else. So I'm offended by what has happened and I'm also angry. I love the city of Chicago and the Chicago police department, warts and all." "But this publicity stunt was a scar that Chicago didn't earn and certainly didn't deserve," he added. Johnson praised the police department's work on the case and later said justice would be for Smollett to apologize to the city and reimburse Chicago for the resources it expended investigating his claim. He noted the accusations in the "phony attack" received national attention from celebrities, the media, and prominent politicians, including 2020 presidential candidates. Sens. Kamala Harris (D., Calif.) and Cory Booker (D., N.J.) likened the attack at the time to a "modern-day lynching" attempt; they've said this week they want to wait for all the facts to weigh in further. Smollett faces up to three years in prison and a substantial fine if convicted, according to ABC News.